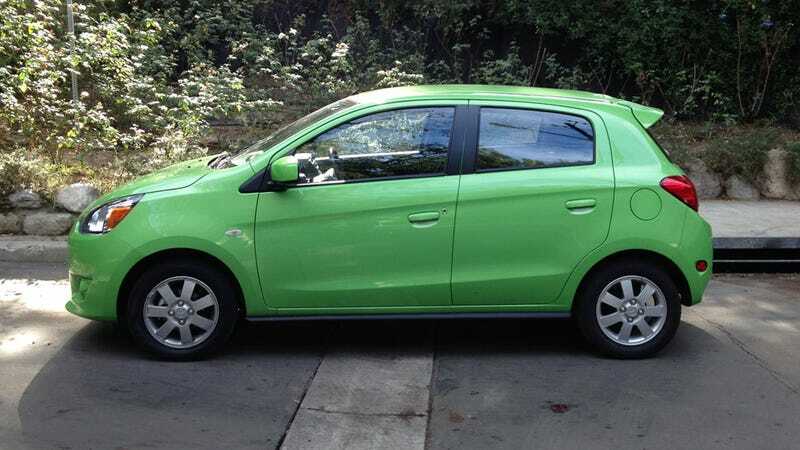 Jason reviewed the new Mitsubishi Mirage and in any other color than Kermit green, it's a forgettable-looking car. Which is a shame, because he apparently liked it for what it is: a cheap, simple car that gets fantastic mileage and is somewhat fun. That's not a lot to ask for $15,000 that comes with a three-year warranty and delivery miles. At this end of the market, fun isn't that common. Neither is personality, or quality, or anything that customers might find endearing enough to make a return purchase when they can afford something with more power/space/toys/etc. We really need cars like this. It's the cheap stuff that people can afford and thus get excited about, that gets people interested in cars again. I like this car already. Even if it isn't the most fun you can have on 4 wheels, this is the sort of thing that can get Millennials (Pariahs of the autosphere) excited. Suddenly cars become affordable again, and maybe something you can look forward to and be proud of, even if it is a tin can. A GOOD cheap car is crucial to building brand loyalty. Eventually the buyer moves up, and the long-term quality of their cheap car will determine what they buy next. Too many manufacturers punish the cheap-car buyer and wonder why they don't come back. Isn't that what used cars are for though? I'm not sure I can imagine anyone being particularly excited over this. There are significant merits to picking a used car over a new one. Insurance and registration are two big running costs that will be less than a new car. But new cars usually have lower maintenance costs, full warranties that make someone accountable if it inexplicably leaves you stranded and it's a lot easier to finance if that's the way you're buying it. So to automakers: why are you penalizing your newest buyers? If a car is going to be cheap, make it fun, charismatic and memorable. What's a better way to gain loyalty?